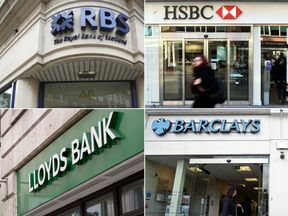 Royal Bank of Scotland is Britain's worst bank, according to new rankings published by regulators. From Wednesday, banks are compelled to publish information on how likely people would be to recommend them to friends and relatives. The Competition and Markets Authority (CMA) published the rankings based on customers online, mobile banking, branch and overdraft experiences. It hopes the move will increase competition among banks and encourage customers to switch. First Direct came top of the personal banking league table with 85% of customers satisfied with the quality of its services. RBS was joint bottom alongside Clydesdale, with fewer than half of customers saying they would recommend the lender. "This is one of the many measures - including open banking and overdraft text alerts - that we put in place to make banks work harder for their customers and help people shop around to find the best deals for them." RBS was also ranked third from bottom for online and mobile banking services. The bank, which paid $3.6bn to settle a financial crisis misconduct probe in the US, was bailed out by the taxpayer in 2008. It has since been involved in numerous scandals, including the mistreatment of small business. "We are aware we have more work to do in order to improve our service standards and deliver a better experience for our customers," RBS said. "That is why we are investing in improving the products and services we offer our personal and business customers, whether that's through launching initiatives such as the UK's first paperless mortgage or ESME, our digital lending platform for SMEs, which are helping us to deliver better service for our customers." Clydesdale Bank, which is owned by Clydesdale and Yorkshire Banking Group, is ranked bottom for online and mobile banking services.